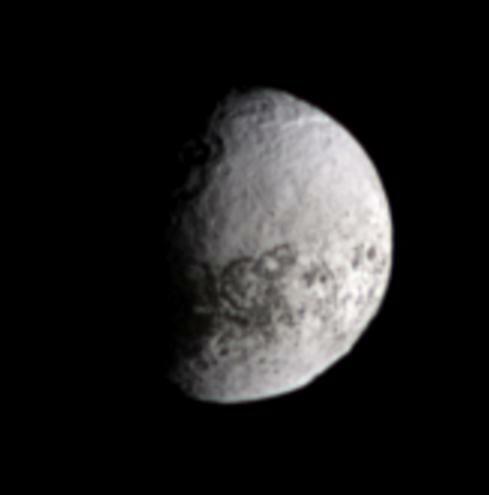 The Cassini spacecraft views terrain on the bright, trailing side of Iapetus in natural color. This side of Iapetus starkly contrasts with the much darker leading hemisphere, and some of the dark material seen here in association with craters near the terminator is an extension of the leading hemisphere terrain. This region was previously imaged by the spacecraft at a much finer resolution -- a spatial scale of less than 1 kilometer (0.6 miles) per pixel -- during a flyby at the close of 2004. This terrain was then on the moon's night side at the time, and Cassini imaged it using weak, reflected light from Saturn (see PIA06168 ). The present view looks toward Iapetus (1,468 kilometers, or 912 miles across) from about 24 degrees above the moon's equator. Images taken using red, green and blue spectral filters were combined to create this natural color view. The images were taken with the Cassini spacecraft narrow-angle camera on April 15, 2007 at a distance of approximately 2.3 million kilometers (1.4 million miles) from Iapetus and at a Sun-Iapetus-spacecraft, or phase, angle of 66 degrees. Scale in the original images is 13 kilometers (8 miles) per pixel. The view has been magnified by a factor of three.